How would you describe the team? Hard working, dedicated, energetic, overall a great bunch. Overview: Production are always producing a noise, whether it is the tape gun sealing a box, the ultrasonic cleaning PCBs and 3D parts or the sound of two pick and place machines together placing 1000s of components an hour. However, if for some strange reason none of that is happening you can always count on is the radio pumping out a tune. 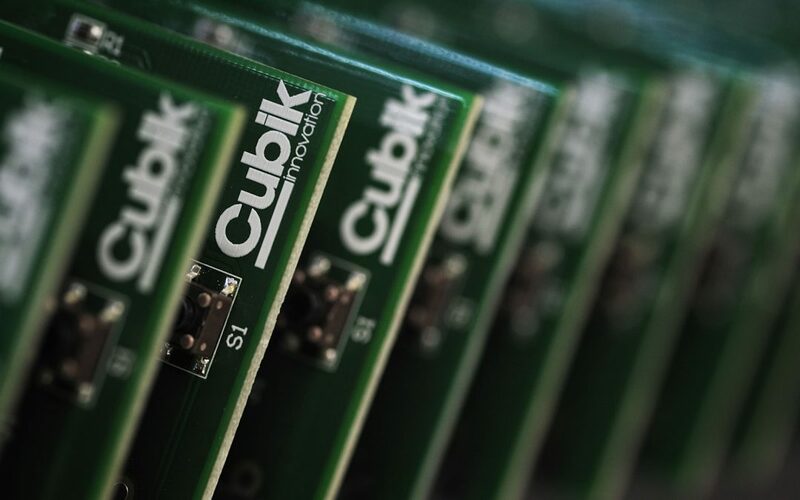 All manufacturing at Cubik Innovation is carried out within our ESD safe environment by one of our IPC Specialist Production Engineers, working to our ISO 9001:2015 systems and IPC-A-610E standards. Our production team have a vast set of disciplines under their belts. Each of them with a skillset that they can focus on and expand, teaching each other with in-house training. Ordering and booking in: Within a typical month production will order and book in 1000’s of unique parts. The parts are marked up with designators and put into a kit or Carousel ready for our production engineers. Build: Batches of boards will get built on the Pick and Place machines, they are pasted on our stencil printer, then the surface mount components are placed by one of our pick and place machines. The PCB is re-flowed and then once completed the surface mount components get inspected and Thru-hole components are added. Each PCB is subjected to rigorous testing and inspection before being packaged and dispatched to our customer. Final Inspection: All PCB’s built at Cubik get a full inspection before they are dispatched. For larger quantities we use our A.O.I (automated optical inspection) machine with smaller quantities the Production Engineer will conduct a thorough manual inspection under a microscope. Testing /quality assurance and shipping: All PCBs are subjected to a number of semi-automated tests by our test engineers who love programming, testing and fault finding. For peace of mind we quality assure every item before it is shipped, this ensures nothing has been damaged during the process. The PCB is then carefully packaged into either the PCB enclosure or into a Static Shielding Bag. Only then can the boards leave our ESD safe area. Contact with the customer: Production has limited interaction with our customer based this is usually dealt with by the project management team, however sometimes our customers prefer the hands on approach and collect their finished products themselves or pop in to check progress throughout the build process.